Julius Suitor — Recipient of the 2018 E.C. Tatum Humanitarian Award! The Davie County Chamber of Commerce held its 49th Annual Awards Gala and Annual Meeting on Thursday, January 18th at WinMock in Bermuda Run. The evening began with a welcome reception of networking and mingling followed by a delicious dinner in the loft. The Awards Gala is the Chamber’s opportunity to highlight achievements of the past year and to honor the recipients of their signature awards: E.C. Tatum Humanitarian Award, Business of the Year, Small Business of the Year, and Chamber Ambassador of the Year. The “Best of Davie” award winners were also announced. This year’s event included a report by Terry Bralley, president of the Davie County Economic Development Commission, sharing the success of the Commission’s five-year capital campaign and detailing future steps for Davie County’s continued economic development success. Keynote speaker Christopher Chung, CEO of the Economic Development Partnership of North Carolina, defined economic development in North Carolina and explained that increasing the wealth of a community, county, or state was dependent upon attracting outside dollars. As a public-private partnership, the EDPNC is focused on advancing the economic interests of North Carolina’s 100 counties and more than 10 million residents. The 2018 Davie County Business of the Year award was presented to the Hollingsworth Companies, by Bralley who recognized the company for its significant contribution to Davie County and its positive impact on the local economy. Since 1998, SouthPoint Industrial Park has brought hundreds of jobs and millions of dollars of investment to Davie County. 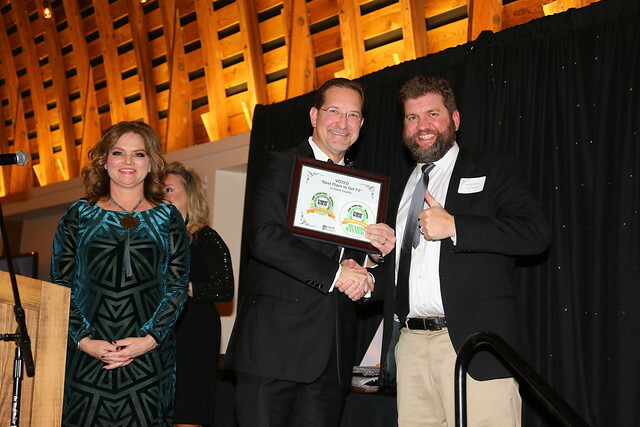 The 2018 Davie County Small Business of the Year Award was presented to DavieLiFE magazine by Chuck Taylor of Sage Garden Care Center who recognized the hometown publication for 10 years of promoting everything good about Davie County. DavieLiFE Magazine celebrates the businesses, organizations, and people that make Davie County the special place that it is. The 2018 E.C. Tatum Humanitarian Award was presented by Lee Rollins, town manager of Bermuda Run, to Julius Suitor who has invested fifty-four years into the Davie County community since coming here to teach. He was awarded the Piedmont Baseball Coach of the year in 1971 and ended his professional career in education as the Wachovia Bank Principal of the Year in 1991. He was recognized as the Mocksville Jaycees Man of the Year in 1976 and received the local NAACP Community Service Award in 2013. He served as the moderator for the Martin Luther King, Jr. speech contest sponsored by the Town of Mocksville and currently serves as the moderator for the Davie County Veteran’s and Memorial Day observances. He recently served as one of the judges for the Davie Respect Initiative. Suitor is the longest-serving board member of the Davie County Economic Development Commission. In 2005 he was honored with the prestigious N.C. Order of the Long Leaf Pine Award. The 2018 Davie County Chamber of Commerce Ambassador of the Year award was presented to Diane Albon of VIP HomeKeeping by Chamber President Caroline Moser. Chamber Ambassadors promote their own companies; promote Chamber events and programs; visit new and existing Chamber members; represent the chamber at groundbreakings, ribbon cuttings, and other Chamber events and assist with Chamber projects. Ambassadors believe in the chamber and have a desire to share with other businesses the many benefits and camaraderie that is gained by being part of an organization. The 2018 Best of Davie awards were presented by Kyle and Elizabeth Swicegood of Century 21 & The Swicegood Group. Please join us in congratulating all of the award winners and thanking them for all they do to make Davie County a great community for us all! For over 49 years the Davie Chamber has served the business community throughout Davie County and the towns of Mocksville, Bermuda Run, and Cooleemee. With professional staff, dedicated volunteers and an involved board of directors, the Davie Chamber continues to promote the economic and civic interests and provide leadership on issues which impact the economy and quality of life in Davie County. For information about the Davie Chamber please contact chamber@daviecounty.com or call 336.751.3304.